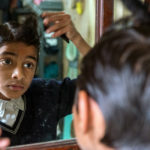 Aditya is getting ready for school. He and his three siblings live in the holy town of Pushkar – one of the most sacred places in India believed to be the center of the universe and always crowded with thousands of pilgrims. 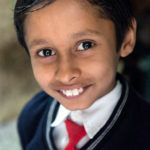 Aditya’s parents try hard to provide the best education possible. They want their children to become decent people. Especially for the boys born as Brahmin, the highest Indian caste, in Pushkar it is highly regarded to become scholars of the ancient Sanskrit texts. Like anywhere else in the world children have other things in mind then patiently reciting and learning. Despite their socks being full of holes and stained trousers all are proud of their nice school uniforms and try to imitate their role models from Bollywood. „Wait… my style is not good!“, with this words Adithya applies even more hair gel, forms a big curl on his head, makes a final check in the mirror and off they go!